I was lucky enough to almost have a 'sneak preview' of a product from the up and coming company, TruBrand. If you've been a reader of my blog for a while you'll know that I adore skincare and finding products that really make the best of your skin. I'm a trained facialist and I find it fascinating is how you can transform your own skin with a good routine and product line. The TruBrand team kindly sent me their Ultimate Deep Cleanse to test out. SaraJane Lynch, the creator of TruBrand suffered for years with eczema or what she calls 'high maintenance skin,' finding that there were no big companies that were helping to combat it for young women wanting to have beautiful skin. Having had a friend with severe eczema I saw how the simplest of products had to be checked for irritants - nothing seemed easy having to have special hand soaps, shower gel, even washing up liquid. As soon as the parcel arrived I just had to try this cleanser straight away. The first thing I noticed was the scent. I cannot tell you how many times I've tried to describe it and the best description I can give is that it's a fairly subtle sherbet lemon style scent. I promise you that it's not overpowering but makes cleansing very pleasant and refreshing. Although I'm not an eczema sufferer, I'm normally left with an incredibly dry face after cleansing, however the formulation of the Ultimate Deep Cleanse is so gentle that this doesn't happen at all. The formula contains wild pansy, comfrey and vitamin E. The extracts of wild pansey act as a natural exfoliator and a toxin cleanser. The comfrey glycerol extract soothes and moisture retaining to ease roughness and damage. Vitamin E is the essential antioxidant to maintain cell harmony. The bottom line is... I have no hesitation recommending this product to anyone with sensitive skin, eczema, or just anyone looking for a good honest UK manufactured skincare brand. Very excitingly this line is due to be launched on the 25th November 2013 into Fenwick Bond Street. 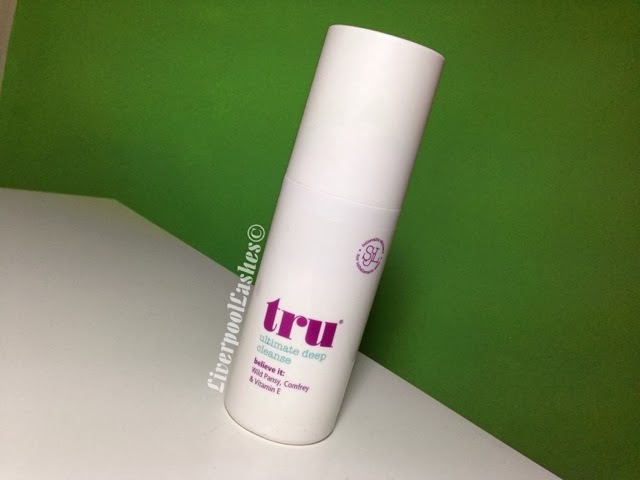 If you're like me and live nowhere near there then the even better news is that their line including their Toning Treatment and Facial Moisture shall be available to purchase from their website www.thetrubrand.com from the 25th November 2013 too. I hope you enjoyed this preview of the brand. Remember - you heard about it here first!